Are you drawn to helping people? Do you enjoy physical activity and love to talk about the benefits of exercise? Have you thought that, perhaps, physical therapy is your calling? If you can picture yourself assisting others, getting them on a path of wellness through movement, then you have what it takes to be a great physical therapist. Check out the Career Talk interview with a physical therapist. Physical therapists work as a part of a treating healthcare team. Your main goal as a physical therapist is to get your patients up and moving again, as well as managing their pain so they can function. Your patients may be someone who has been in a car accident, or maybe a small child with a chronic condition. Regardless of the ages or types of ailment, you will work directly alongside them, providing a personalized plan of action for each patient and their condition. Exercise is the most common technique used in a physical therapist’s treatment. But how it’s used will depend on what’s going on with the patient. Many patients have to rely on some kind of functional equipment such as crutches, a walker, or a cane. As a physical therapist, you’ll have to take that into account when creating a routine for them, using their equipment as part of their exercises. Stroke patients will need different care than someone with a sports-related injury, just as much as an elderly patient will most likely receive different treatment than an adolescent. Physical therapists can specialize, allowing you to focus more intensely on a particular demographic. Physical therapists can specialize, and there are five different areas with two more gaining in popularity. To specialize, you have to get the appropriate certifications—which means additional requirements—as well as passing an exam to earn the accreditation. Becoming a certified specialist is voluntary, and it won’t prohibit you from having a varied practice. However, to specialize, you must meet the qualifications: a current U.S. license, and a minimum of 2,000 documented hours of training in the area you want to specialize in within the last three years. Geriatric: As people get older, they have a varied and unique set of needs. Geriatric physical therapists focus on those issues faced by aging adults, helping to restore mobility, reduce pain, and improve their overall fitness levels. Their average salary is over $61K. Pediatric: Infants through adolescence are the primary focus of pediatric physical therapists. They help children who are suffering from diseases, illnesses, or other conditions that affect their movement and growth to alleviate pain, have a better range of motion, and improve fine and gross motor skills. They earn an average of $72K annually. Orthopedic: If someone gets an injury in his or her joints, orthopedic physical therapists will treat the issue. They use heat, cold, joint mobilization, ultrasound, and other techniques to aid in the healing process. Their salary range is in the $80Ks. Neurological: Disorders and diseases of the brain can profoundly affect a person. A physical therapist specializing in neurological conditions can help patients improve their quality of life. They can make $116,000 and over with experience. Cardiopulmonary: Conditions of the heart or lungs can be crippling. And the resulting surgeries aimed at correcting or alleviating the conditions can be as equally physically devastating. The cardiopulmonary physical therapist will concentrate on increasing the patient’s endurance and functionality. Heart attack patients commonly work with physical therapists as part of their rehabilitation. Cardiopulmonary therapists make well over $75K annually. Two more rising sub-specialities are in women’s health focusing on pelvic pain and other issues unique to women, and vestibular rehab, which deals with diseases of the middle ear that affect equilibrium. Physical therapists can be found in many different work environments. You’ll be able to find employment in hospitals, medical centers, ERs, nursing homes, and rehab clinics, to name a few. Some even work as their own bosses, taking on private clients and working out of either their own homes or their clients’, depending on how mobile the patient is. More than 80% of physical therapists work outside of a hospital setting. If you also have a good business mind, you may even want to consider starting up your own physical therapy outpatient clinic. 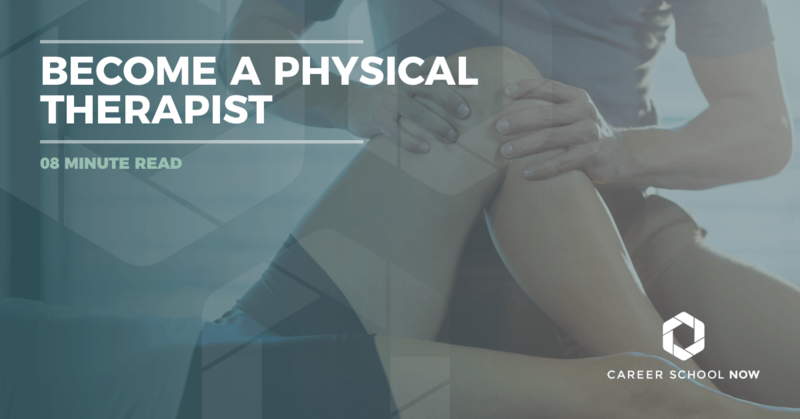 There’s a lot to think about when it comes to where you want to take your career as a physical therapist. It’s true: There is a lot of schooling ahead of you if you want to become a physical therapist. But it can be so worth it. Physical therapy is considered one of the best careers with regard to job satisfaction. Also, you earn a higher than the average salary, which will be covered further on. Because there’s so much involved, let’s break it down into bullet points. Get your bachelor’s degree in an area like physics, anatomy, physiology, or chemistry. Enroll in and finish a Doctor of Physical Therapy program at one of the over 200 accredited university programs. Expect it to take a minimum of 6 years to complete and include one year of internship. Get licensed. All of the states have their own requirements, but the common denominator is that they all require physical therapists to operate with a license. If you don’t have one, you can’t be one. You have to take the National Physical Therapy Examination (NPTE) through the Federation of State Boards of Physical Therapy. Make sure to find out through your state’s boards what is specifically required of you. Pass a criminal background check and law exam. There is an option to do a residency. These last one year but can help you with experience, especially if you decide you want to specialize. There are also fellowships available, another option. After working as a licensed physical therapist and have around 2,000 hours under your belt, then you can choose to become board certified in one of the many areas of specialties available. Whether you decide you want to start out slowly and get an associate’s so you can work as a physical therapy assistant, or you want to go all the way and get your doctorate in physical therapy, make sure you attend a program accredited by the Commission of Accreditation in Physical Therapy Education (CAPTE). These schools have gone through a process to ensure their programs are the highest quality of educational standard. This means you too, online schoolers. An associate’s degree is available, but it’s strictly for a physical therapy assistant diploma. Alone, it makes an excellent career choice. But it’s also a great stepping stone toward a bachelor’s degree. Bachelor’s Degree: Here you’ll be in a pre-physical therapy program. You’ll take courses suited to introduce you to the doctoral degree. You will have to take classes similar to Athletic Injuries, Pharmacology, Healthy Psychology, and Health Science Statistics. A typical bachelor’s degree program will take a minimum of four years to complete. Doctoral Degree: Master’s degrees in physical therapy are not available. You’ll go from your bachelor’s program to the doctoral program in physical therapy. This portion of your education will take around three years to complete. You’ll have to take courses such as Critical Thinking, Clinical Experience, and Clinical Decision-Making, among many others. 25 percent through 2026. Okay, let’s put this into perspective. The average occupation will see a five to seven percent growth during that same timeframe. So, to say that physical therapy is going to see a tremendous increase is an understatement. If you’re wondering why this boom, it’s because of the baby boomers. They are aging, and in turn, will need the services that physical therapists provide. Also, life-threatening diseases such as obesity and diabetes are at an all-time high, and physical therapists will be called in to help these patients maintain or achieve a level of normalcy in their movement. The total cost of the education necessary for a degree in physical therapy can run over $100k, and that’s not including the bachelor’s degree portion. One of the many bonuses is that physical therapists are rewarded with a higher than average salary. The average salary in the U.S. is a bit over $50K. Physical therapists have an annual median pay of over $85,400, while the highest 10% or those with a few years of experience will earn well into the $120Ks. So yes, it might cost a lot for the education, but a great salary in a fabulous field will be your reward. Physical therapy is a better than excellent career option, where you can enjoy high job satisfaction and very low stress. It was rated by U.S. News and World Report as number 12 in best healthcare jobs, and number 16 in the top 100 jobs overall. Go ahead, give it a try!